Today’s post is a little bit different, I have recently been developing a beauty, fashion and lifestyle forum to create a community for us like-minded people. Sign up easily with either Twitter or your Facebook. Using the forum readers and bloggers will be able to show off their favourite or most recent posts, be able to promote themselves and reach a larger audience. There are topics for recent images of your nail art, make up, hair or outfits to provide inspiration for others. 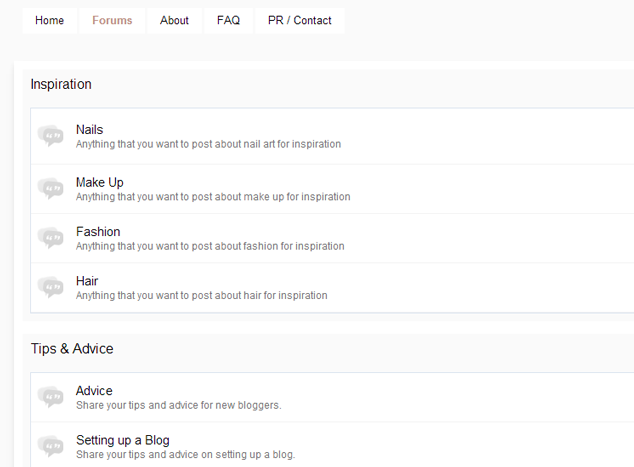 I get emails regularly on advice or tips, there is a section dedicated to this so that if anyone has any questions about fashion and beauty or the blogging world they can be answered here by the community. Another topic I have included is for events and meet ups. Events are advertised all over the place and can be easily missed on twitter. Post your events on here so it can be easily found in one place and reach the right target audience. On the forum you can also post about any offers, give-aways or competitions you know of or are hosting that will link back to your page. I want the forum to be an exciting platform where bloggers can chat, connect, find inspiration and grow their audience. There is a badge for Strikeapose Community members to show on their blog, please put it on your blog and share it, the more people involved with the forum, the more people who will see your posts! You can find the badge on the forum page, just copy the script and place it in your sidebar/widget area.The forum should be an opportunity for bloggers to raise their blog visits, SEO and reach a wider, new audience, even if they are a new or established blogger. There are more ideas on where the forum will go and how it will develop, such as a monthly newsletter featuring different bloggers. The forum can be adapted by any feedback given. You can either reach the forum by clicking the link at the top of the page or the badge to the right side of the page.